“I see a boat.” I say with a light nudge to my friend Jes sitting to my left onboard a gigantic, stuffy Airbus inbound to Iceland’s Keflavik Airport. We were on the verge of finishing a 9-or-so hour flight from LAX. 9-or-so hours into a week-long escape to Europe to relax and have a nice change of pace over our busy, exhausting jobs in Southern California. After 8.5 hours of flying in complete darkness, seeing a small boat in the ocean was a nice change of pace as well. It also meant that we were on approach and would soon be seeing Iceland’s gorgeous green and mountainous landscape, which we would have the following 19 hours to explore by rental car before continuing on to mainland Europe. The plan was the following: fly in, get a rental car, immediately drive all over the southwestern portion of Iceland checking out waterfalls and other cool geographical features, head into Reykjavik in the evening, grab dinner, crash with a friend, wake up at 4 AM, go back to the airport, and wave goodbye to Iceland. Thanks to WOW Airlines’ policy of not turning down the house lights on their flights (my only real qualm), I napped for nary a combined 2 hours. But the second I got a peek outside at the stunningly beautiful geography, I was instantly filled with excitement and no longer felt tired. I was ready to take off down the road and get an up-close view of what Iceland had to offer. Keflavik Airport was absolutely tiny. After a quick stroll through border control we were outside on our way to the rental car company area. There were no massive parking structures or seas of remote parking, just a minuscule parking lot next to the Departures lane. This made me already start to experience culture shock; I was much more used to the great, confusing beast that is LAX. We may or may not have massively jumped the line to hop on the bus to the rental car area (“just act European” I said to Jes with a smirk as we scuttled past a bunch of other Americans). After approximately 1 minute and 30 seconds onboard (it would have been a 4-minute walk) we hopped off and walked up to our rental company’s building. Oh the possibilities of what our rental car was going to be! A few weeks prior Jes had notified me that a newest-generation Mazda2 was on the list of potential rental cars, the next-of-kin to my very own 2014 Mazda2. Other choices I came to find out were a Kia Cee’d, Toyota something-or-other, Dacia Duster, Ford Fiesta, Peugeot 308, and VW Golf; all of which would presumably be diesel. While we stood at the desk signing paperwork, I kept an eye on the activity outside, eyeing the cars being pulled around and left idling, trying to guess which one could be our faithful steed. “OK let’s get your car” the attendant said, and led us over to a minty fresh, sub-1,000 KM 2018 Peugeot 308 Diesel. I gasped with joy. I had never driven a Peugeot before! Watching Top Gear and reading European car mags in Borders and Barnes And Noble since I was young teenager, I’ve always had an appreciation for the iconic French brand, especially the 206, 207, and current 208 GTi. While I certainly wish one of those was my first Peugeot, I was quite thankful we weren’t stuck with a bland Toyota or Hyundai. I hadn’t driven outside the USA before, either; these combined new experiences ensured a very memorable trip! Since Jes had driven in Iceland before and she was the primary on the rental, she took the first stint of getting our bearings, driving somewhere to get a bite to eat, and making our way to our first stop. I snapped a quick photo of her next to the sleek French hatch for posterity and we were on our way. 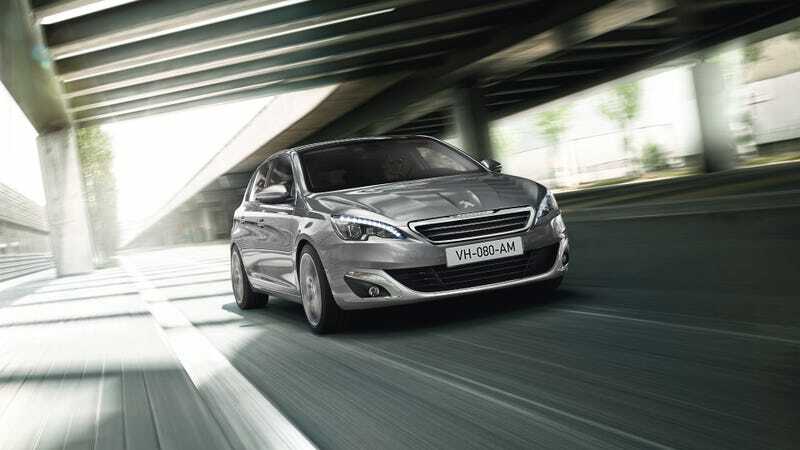 The Peugeot 308 was very nicely equipped. Since it’s the nicer, larger sibling to the 208, it is expected to be a cut above and accommodate the hard-working middle class with comfort, great amenities, sportier handling, good fuel economy, and excellent safety ratings. It fulfilled all of these, and even proved to be the best road trip car we could’ve asked for. Since we wouldn’t be doing any off-roading or vehicle camping, all we needed was comfort, good visibility, and torque to pass folks on Iceland’s 2-lane roads to get the most out of our 19-hour visit. The seating in the 308 was nothing short of excellent for its class. The seats accommodated my long-leg and long-torso body just fine and at 6’3” I had plenty of headroom. “I could wear my Arai in here and not have to recline my seat!” I exclaimed to Jes. Her first eyeroll of the trip over my comments was on the board! Being it French, there was plenty of room for a beret as well. The seats had higher-than-average backs, nice side bolstering and quick-to-fire-up heating. The range of temperatures was nice: It began at “crisp Fall day in Los Angeles” and topped out at “near proximity to Eyjafjallajökull Volcano in early 2010” (side note: I was stuck at the Dusseldorf airport for many hours thanks to that volcano). Certainly useful for anyone visiting a country that barely approaches 75 degrees Fahrenheit in the Summertime, and temperatures that I never want to experience in the Wintertime. The specific trim we had, the one that comes equipped with Peugeot’s surprisingly-spirited 1.5 BlueHDi engine and 6-speed manual gearbox (more on that later), was laid out in interior materials that I found to be better-than-average. The soft-touch leather and hard-yet-substantial plastics on the dash felt great and were nicely designed. They were simple and sleek. I would rate interior quality as almost as nice as a Mk7 VW GTI. I can only imagine how the sportier, more athletic Peugeot 308 GTi would stack up to our economical diesel variant. I had plenty of leg room on the passenger and driver side, and while I didn’t sit in the backseat, there was good room back there as well. The hatch was also massive – had we been more generous in our packing than just a backpack apiece, or traveled with friends, everything would’ve fit in the 425-liter hatch without issue. A large center console touch screen controlled almost all of things one would adjust, sans volume; the stereo system, blue tooth, navigation, and climate controls were operated by finger tap. As a bit of a luddite when it comes to touch screens in cars, surprisingly this did not get on my nerves. It scrolled through menus and adjusted everything without lag. Tired of listening to the Icelandic equivalent of Jack FM? One quick tap of the screen and the you’ve got a warm introduction to Icelandic folk rock (very catchy, I might add). The all-encompassing quality of the interior certainly made the 308 an excellent long-distance hauler; it allowed us to not fumble with controls, and instead gaze out the window at beautiful variations in geography. From gorgeous snow-capped mountains, inactive volcanoes, and brilliant green rolling hills to rocky, moon-like flat lands along a tepid shoreline, Iceland is a gazer’s dream. The excellent visibility and ergonomics lent very well to ensuring a good view of our surroundings as well. The cabin felt very airy, with large windows and an absolutely massive front windshield sitting at a deeply-raked angle. The center gauge cluster is more recessed toward the firewall, above the steering wheel, allowing the driver to keep the gauges in their lower periphery with ease while they mind the road and enjoy the scenery. It was a nice change of pace to be in a car where I could lower the steering wheel into my lap for a nice engaging position. From what I’ve read this is considered a general French driving position; as a lanky gentleman with an upright driving position I definitely dig it! Not only was the driver’s perspective and position great for ticking off the miles, but also for when the road started winding through the mountains and became a lot more fun. I mentioned earlier that the interior quality just about stacked up to the Mk7 VW GTI; its handling and performance was just about there as well. With a stable and solid, yet compliant and comfortable ride quality, the 308 was a fun chassis to rev out and have a little fun once the road got a little twisty. According to Peugeot, this is done by increasing chassis rigidity but maintaining softer spring rates. The soft-sidewalled all season tires certainly lent a hand in ride comfort as well. It felt as though it was outfitted with larger-than-normal front and rear sway bars as it was compliant, yet during spirited driving it’s body roll was not bad at all. Steering, although anemic, was light and direct. The shifter feel was light and direct as well; also very Mk7 GTI-like, though with a little more spring to it. One could say that while I was behind the wheel, I might have allegedly doubled the advisory speed limit coming through a few roundabouts. When right and left curbs entering a roundabout are flat and not unlike certain corners at Buttonwillow Raceway Park, what’s a SoCal HPDE driver allegedly to do? Iceland has less than 400,000 inhabitants, meaning sometimes roundabouts are completely empty. There are also very, very few traffic lights outside of Reykjavik: bless the Icelanders and their massive number of roundabouts. Brake in a straight line, get on the gas, turn right and roll up onto the outside-right curbing, come in and roll up onto the inside-left curbing, follow around, track out right while barely touching the outside curbing, and exit. That’s one way one can maneuver through a roundabout with gusto and… um… fuel economy, of course! Why waste all that momentum and screw with the Peugeot’s excellent gas mileage? Almost every American probably comments about this when they drive European diesel vehicles, but the punchy 1.5 turbo diesel that our 308 was equipped with took me by surprise. “Ya see, this is why diesel rules!” I said to Jes as I took off down the road, reaching 1st and 2nd gears’ 5000-or-so RPM redline surprisingly quickly. Second eyeroll of the trip over my comments on the board! Iceland is a country of 2-lane roads, so having instant diesel torque was very useful. Jes and I both drive like a mix between a New York cab driver and a Los Angeles BMW 3-Series driver. Due to this, we had no qualms with downshifting 2 gears, putting the hammer down, and revving out the little French 4-cylinder as we veered left and shot past fellow tourists who were driving like, well, tourists, in their bland Hyundais. I must admit: I’ve had a hell of a time trying to figure out which trim our 308 was. It had what looked like base wheels, less chrome (well, fake chrome) accents than other models, it was indeed a quick diesel, it was nicely equipped, etc. I am going to assume that based on taking a look under the hood and comparing the trims available in mainland Europe, ours was indeed the 1.5-liter BlueHDi engine making 130 horsepower. 130 horsepower may not sound like much, but when that figure is paired with 221 lb. ft. of torque in a vehicle that only weighs around 2600 lbs., power was certainly ample. Every time I pulled out onto a main road, I would wind out 1st through 3rd gear, and even sought to lug out the engine while climbing up mild mountain passes. As long as the RPMs sat north of 1,500 it chugged right along. Turbo lag was mildly noticeable and not really an issue. Power was absolutely great for just 1.5 liters and a little OEM-spec turbo. The Peugeot 308 diesel really is an awesome car when exploring a stunningly gorgeous and never-before-visited country. With its excellent greenhouse, good diesel fuel economy, excellent passing power, cavernous cargo room, comfortable seating position, smooth-yet-sporty ride, and light inputs, it’s a great place to hang out in and tick off the hours. It was even equipped with nicely-sized cupholders in the center stack and in the door pockets; I was glad to see America’s influence on beverage portions had graced the great country of France. As long as I had fuel, good tunes, coffee and food (coffee more so), satellite navigation, and reasonable weather, I could’ve spent more than a couple days just driving around Iceland, stopping at its various breath-taking waterfalls and picturesque landscapes. Unfortunately our time with the 308 was short; just before heading back into Keflavik Airport around 6 AM to continue our journey, we dropped it off and bid farewell.. The Peugeot’s nice driving characteristics and comfortable amenities ensured I was relaxed yet engaged; I was able to gaze out across the horizon for a moment as well as be entertained by how it drove. I’ll figure out what its trim was someday, but I know for certain it wasn’t the highest-tier “Expensive” version, per Peugeot of Iceland’s website. That’s right, the best-equipped version is called the “Expensive” (see below). I hope I have the opportunity to drive more Peugeots in Europe in the future, and man I hope they come through with returning to the US market.